clipboards/books can be used to help measure accurately (see process below). Large callipers are an additional tool that can be very useful. These can be made locally from wood. Six measurements from the wheelchair user are needed to choose the best available size of wheelchair for for a wheelchair user that has good trunk control and does not require additional postural support. Seat Width; Measured from the widest aspect of the user’s buttocks, hips or thigh. It should be wide enough to avoid pressure on the hips. Seat Depth; Measured from the user’s posterior buttock, along the lateral thigh to the popliteal fold with your palm horizontal to the seat. Usually, a space of about 2 inches is preserved to avoid pressure from the front edge of the seat against the popliteal space. You should be able to fit 3-4 fingers between the front edge of the seat and the back of your knee. Seat Height; Determined by the height of the individual and if the wheelchair is self-propelled. When using the feet to propel, the seat height should allow for them to reach the floor with their heel. Those using footrests have higher seat heights. It is measured from the user’s heel to the popliteal fold. The bottom of the footrest is 2 inches from the floor. Armrest Height; Should allow user sit erect, with level shoulders when bearing weight on the forearms as they rest on the armrest.It is determined by measuring the distance between the seat of the chair and olecranon and adding one inch. Backrest Height; The inferior angles of the scapula should be approximately 1 finger-breadth above the back when the user sits with erect posture. It is determined by measuring the distance between the seat of the chair to the patient’s axilla, and subtracting four inches. The height of the backrest depends on the needs of the user. Wheelchair users who push themselves need a backrest which allows their shoulders to move freely. Wheelchair users who have difficulty sitting upright may need a higher backrest which gives more support to the spine. Footrest Length; Affects the support of both the feet and the thighs and the clearance of the footplates and the ground. The footplate must be about 1 to 2 inches off the ground to permit adequate ground clearance. Check there is nothing in wheelchair user’s pockets before measuring. Measure hips or widest part of thighs. Holding two clipboards/books against each side of the wheelchair user can help in obtaining an accurate measurement. Place a clipboard/book at the back of the wheelchair user to help get an accurate measurement. Measure from the back of the pelvis to the back of the knee in a straight line. Always measure both legs. If there is a difference between the two legs, check that the wheelchair user is sitting up with the pelvis level. If there is still a difference, make the wheelchair prescription for the shorter side. Measure from the back of the knee to the base of the heel. Make sure the wheelchair user’s ankles are bent at 90 degrees (if possible). Measure the seat to the bottom of the rib cage. To help find the bottom of the rib cage, place hands on both sides of the pelvis. Gently squeeze hands inwards and slide hands upwards. The bottom of the rib cage is just above the waist. Measure from the seat to the bottom of the shoulder blade in a vertical line. A wheelchair user’s seat to axilla (armpit) (measurement H) less 30 mm is themaximum distance between the top of the cushion and the top of trunk side pads/wedges (wheelchair component measurement 8). The examples above demonstrate that the body measurement does not always equal the wheelchair component measurement and some calculations are needed. In some cases there is a formula to help work out the wheelchair component measurement. Adjustments are often needed at the fitting. However accurate body measurements can help to prepare the wheelchair well ahead of the first fitting. The illustrations on the intermediate wheelchair assessment form help to guide wheelchair service personnel as they take the body measurements and relate them to the location and size of Postural Support Devices. Take measurements of the wheelchair user sitting upright, in the posture that has been identified as the most upright, comfortable and functional for them during the hand simulation. If a wheelchair user is measured lying down, the measurements will not be accurate because when lying down the wheelchair user may lengthen or stretch out. It is better to get assistance to support the wheelchair user sitting upright than to lie them down. Check there is nothing in the wheelchair user’s pockets before measuring. Measure the wheelchair user’s hips or the widest part of his/ her thighs. Hold two clip boards against each side of the wheelchair user to help to get an accurate measurement. Calipers can also be used. Hip width equals the seat width or the distance between pelvis side pads. If pelvis side pads are provided, the wheelchair seat width may need to be wider. Always try to keep the wheelchair width to a minimum. In countries with cold climates where thick clothes may be worn, some allowance may be needed. Place a clip board at the back of the wheelchair user to help get an accurate measurement. Measure from the back of the wheelchair user’s pelvis to the back of his/her knee in a straight line. If there is a difference between the left and right side, check that the wheelchair user is sitting upright with their pelvis level. If there is still a difference, make the wheelchair prescription for the shorter side. Seat depth less 30 - 50 mm equals the depth of the seat of the wheelchair. For a wheelchair user whose knees are bent a lot less than 90 degrees, the seat depth may need to be slightly shorter. See the box `For wheelchair users with a fixed posterior tilt of the pelvis or fixed forward bent trunk`. Measure from the back of the wheelchair user’s knee to the base of his/her heel. Make sure the wheelchair user’s ankles are bent at 90 degrees (if possible). Always measure both legs. If the wheelchair user wears shoes, measure with the shoes he/she wears most days. If the foot is fixed in plantar flexion (pointing downwards), measure to the toe. The calf length height equals the top of the cushion to the footrests OR the top of the cushion to the floor if the wheelchair user is foot propelling. The exact footrest location will change slightly depending on how much the cushion compresses when the wheelchair user sits on it.Final adjustment is always needed at fitting. Measure from the wheelchair user’s seat to the bottom of the rib cage. To help find the bottom of the rib cage, place hands on both sides of the pelvis. Gently squeeze hands inwards and slide hands upwards. The bottom of the rib cage is just above the waist. Measurements D, E and F help decide the height of the backrest. The height depends on the needs of the wheelchair user. to decide how high the backrest needs to be to provide the right support for the wheelchair user. of wheelchair user’s shoulder blades). Remember to consider if the wheelchair users will be propelling the wheelchair themselves, they need freedom to move their shoulder blades. 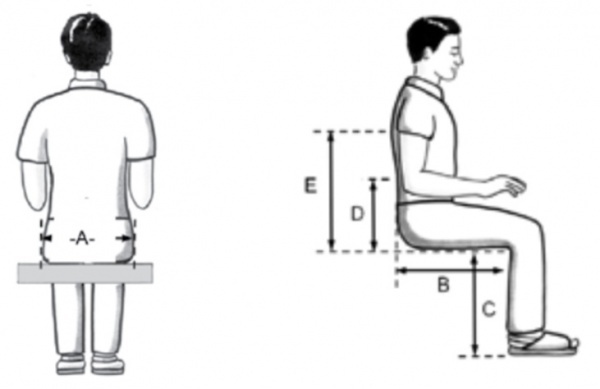 E: Seat to shoulder blade: Measure from the wheelchair user’s seat to the bottom of the shoulder blade in a vertical line. To help find the bottom of the shoulder blade ask the wheelchair user to shrug their shoulders. F: Seat to top of shoulder: Measure from the wheelchair user’s seat to the top of the shoulder. The final position of the trunk side pads or wedges may change during fitting, if they are to be placed lower than just below the axilla. is a guide. The final height depends on the assessment and fitting. to put pressure into the axilla (armpit). This can be uncomfortable and cause permanent nerve damage. There should always be at least 30 mm clearance between the top of a trunk side pad and the axilla. See the box `Measuring side trunk supports for a wheelchair user with scoliosis`. Measure from the seat to the top of the pelvis (PSIS). The seat to the top of the pelvis (PSIS) measurement is used to locate the mid- height of the rear pelvis pad. The depth (thickness) of a rear pelvis pad depends on the results of assessment. Measure the distance between the two knees – with the knees placed as close to neutral as is comfortable for the wheelchair user. The distance between the two knees equals the width of a knee separator pad. The distance will depend on the wheelchair user’s sitting posture. Measure from the seat to base of skull. The measurement from the seat to the base of the skull helps to locate the headrest. Measure from the back of the pelvis to the seat bones. From the side of the wheelchair user place your hand (palms up) under the wheelchair user’s bottom to find the seat bones. Locate the seat bones with one finger and then withdraw your hand to the side of the wheelchair user. Measure from the back of the wheelchair user’s pelvis to the finger that is located at the seat bones. Wheelchair service personnel may mark on the assessment bed in some way (for example with a piece of chalk) alongside the wheelchair user in line with their seat bones and measure from the mark to the back of the pelvis. of the pelvis or fixed forward bent trunk the measurement may be different (see the box `For wheelchair users with a fixed posterior tilt of the pelvis or fixed forward bent trunk`).